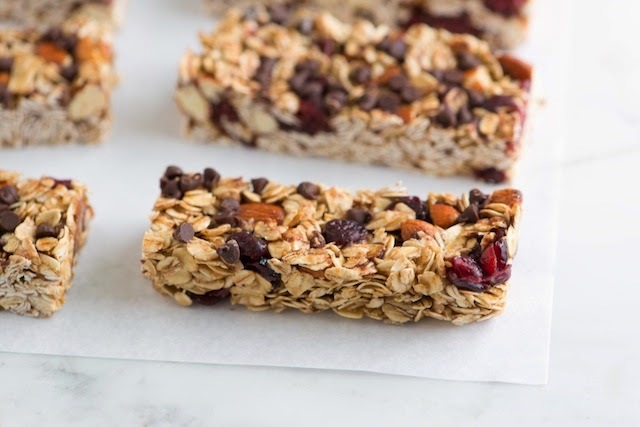 Friday Goodness: How to make healthy Granola! I got tired of eating cereals several months ago, unto the next best thing. I discovered granola!! I usually buy granola bars from time to time, but they aren't filling at all, they are costly and contain huge amount of sugar. What scares me the most, is not even knowing what i'm actually eating. Yikes! As usual, madam Cheliz had to invent her own (i know you are thinking "must you always make your own?" Well, yes i must) Hehehehe! *This month i decided to eat lots of grains, all manner of grains, legumes, seeds etc. Hence this post! For more grains and legumes recipes, kindly subscribe to my food blog. I have some recipes there. Lets widen the gap and use food the way its meant to be used. * I talk too much shey? Lol! Aside from the nuts, this dish is not that expensive to make. To save money, try a mixture of just cashews and peanuts. 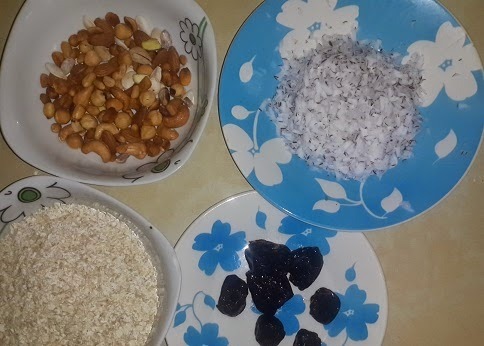 Clockwise from bottom left: Oats, nuts, coconuts, prunes. Honey, sugar and salt, olive oil. 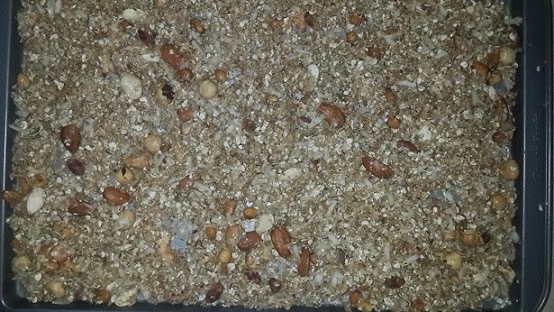 The mix, before getting in the oven. 2 cups of uncooked oats. 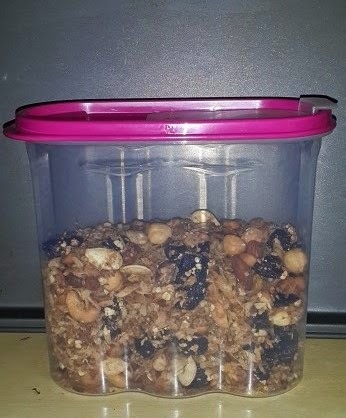 100g of mixed nuts(whole) I used: peanuts, cashews, hazelnuts, almonds, pistachios, Pumpkin seeds and sweetcorn, all roasted and salted. You can buy raw. 1 cup of coconut_Freshly grated. 1 Sheet pan or baking tray. 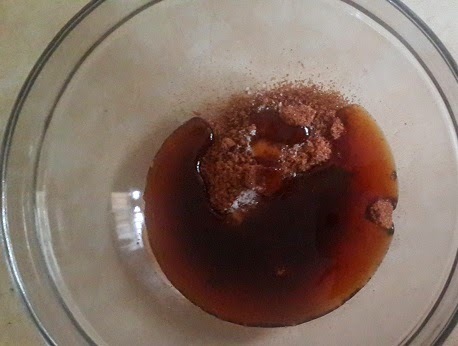 In a small bowl, mix the sugar, honey, oil and salt together. 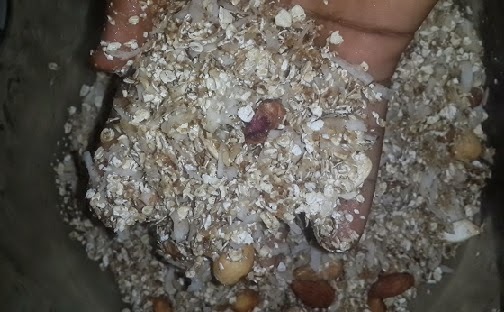 In a larger bowl, mix in the 2 cups of oats, and all the dry ingredients plus the shredded coconut, except the prunes(you wont need to bake them). Add the sugar mixture into oats mixture and mix with your hands. Mix very well. Pour the mix unto your sheet pan and place in the hot oven. 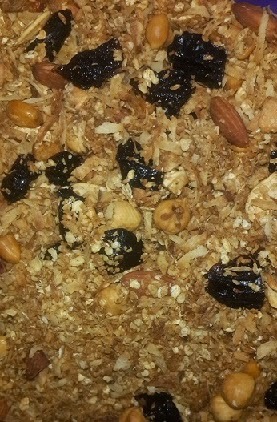 Allow to bake for a total of 20 mins, if you are using already roasted nuts, or 1hr for fresh nuts. Stir the mixture every 5 mins, so that it doesn't burn underneath. We are using less oil, so we need to be very careful. Its a very delicate dish. When it has turned golden brown all round, bring the tray out and pour into a cool bowl. Allow the mix to cool down well, then add the chopped prunes and mix well. Pour into an air tight container and store. I prefer to store in the fridge, so that i can have it with warm milk. This is what the cooked version looks like, all browned. Store in an airtight container like this. this is what mine yielded, so increase the oats if you want more. This dish is very playful and versatile. 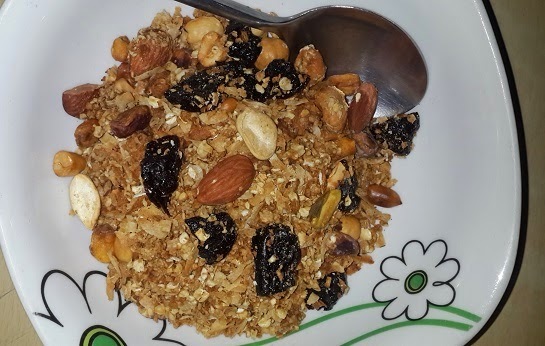 The base of which is oats, play around with nuts and dried fruits, crackers, chocolate chips, etc mix it however you want, but know that the more stuff you add, the less of it you can eat at a sitting. Lol! Please, try this dish, you will love it. the aroma is divine, the taste nko??? Na World cup!!! This is lower in calories than store bought and LOADED with nutrients, a cup and half of this is great for breakfast. Its about 250 calories or less if you use skimmed milk. Have you tried something like this before? God bless. cheliz nice one. no water ? Not while baking dear, you can add water or milk when ur ready to eat. Thanks. Ok. Thanks dear. I have all the recipes will try it and let you know may be next month. ok, luv, no problem. Thanks. Ok pls do. Thanks Amanda. Cheliz I commented. On yesterday's post needing your help wth a platea I recently hit but cat find a response or even my comment lol.today its another problem,pls help a sister out.am trying to start a blog for my educational company.pls kndly walk me through the steps,thank you. Mummy Chichi, i didnt see your comment yesterday, maybe its network. You mean steps to start a blog? Its not really difficult depending on the kind of blog. Why not look for a techy guy or babe to help you with that, just tell them what you need. Whats your question about the plateau? Cheers. Amanda, i replied you some hours ago, tho i didnt see any picture. Pls send to my tocheli@yahoo.com thanks. I have someone working on a website for me,just wanted to start a blog in the meantime,thought its somethng i Could DIY but its provng a bit difficult!About the plateau,I had my baby 3 months ago,started working out with a dvd&eating clean 1 month ago,dropped like 7kg in two weeks,was so excited thinking it wll contnue lke that&then hit the most annoying plateau.cant change my workout by running or gong to the gym cos of the baby.am eating lke 1000 calories a day,no joke.my clothes fit great&i look really good but the scale just won't shift! It can be a bit of a headache, and takes time. Sorry bout that. On the plateau ish, just forget about the scale and do ur thing since you are seeing results with your clothes, the scale will shift with time. It happens. Sounds like you are doing a great job, so not to worry. But truth is, if you really want to keep losing weight, you have to step things up a notch, either by way of ur meals or exercises. All the best Mummy Chi Chi. Hi, pls send me a mail on chelizruby@gmail.com. I will give you the details. Thanks.